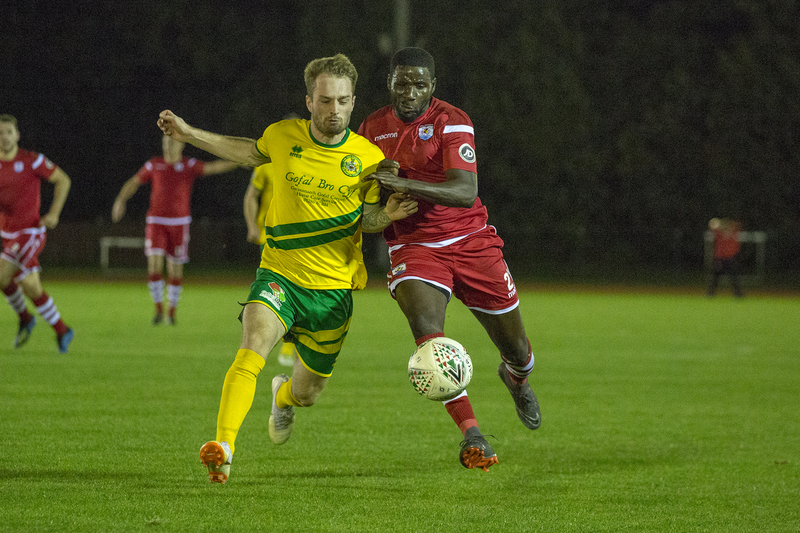 Survival is always first and foremost for any newly promoted club but Caernarfon Town are showing early promise in their season back in the JD Welsh Premier League. After starting the season with two wins and two defeats from their opening four games, Caernarfon picked up what is their best result of the season to date with an excellent midweek win over Connah’s Quay, which leaves them sitting nicely placed, fifth in the table. Getting three points from a trip to the Deeside Stadium never comes easy and Sean Eardley will have been delighted with the nature of the performance his Caernarfon team produced. The Cofis visited one of the most uncompromising sides in the league and essentially beat them at their own game. Connah’s Quay are renowned for their defensive resilience, strong off-the-ball work ethic and the ability to hold firm under pressure and this is exactly how Caernarfon earned their victory. Jamie Breeze’s goal on the stroke of half-time will have changed Eardley’s pip-talk during the break and for the duration of the second half it was about preserving their lead and defending it with everything they had. The challenge now awaiting Caernarfon is can they preserve their position in the top-six until the end of the first phase of the season? That would guarantee the club survival as well as giving them a shot of the money-spinning opportunity that is competing in the UEFA Europa League qualifying rounds. It’s early days of course, but two things need to happen if they are to be that genuine top-six threat: scoring goals with more regularity and achieving consistency. The Cofis have managed just three goals so this season, a tally that has seen them secure three 1-0 victories. Relying on winning games by a single goal is a risky business, particularly in a league so evenly matched as the WPL so they are going to have to convert their chances if they are to remain competitive. Likewise, the side need to improve their consistency. Their previous wins have each been followed by defeat – a steady run producing a good return of points could prove invaluable. Sean Eardley alluded to both points when speaking after Tuesday night’s win. over Connah’s Quay. “It’s vital we now follow on that result this week – we’ve got to kick on now,” he urged. “We’ve got to make sure we’re building confidence after that [win against Connah’s Quay] and take it into Barry on Saturday. Discussing their lack of goals he said: “That illusive second goal would be a bonus to be fair but we’ve had opportunities down at Cardiff Met and we’ve had opportunities at Cefn Druids. “Once you’ve nicked a goal and are in front – and I think a few managers said last weekend – you have something to defend, and I think with the level of competition in the league, teams will find it hard if you are organised, honest and you do the right things and you listen to instructions. Successive home fixtures against Barry Town and Llanelli – two south Walian teams who’ll be making the long trip up north – could be the ideal opportunity to carry on their run. It had been a fairly miserable start to the season for Carmarthen Town but the Old Gold are a team on the up. Results might have gone under the radar following their unspectacular start that saw them lose to Bala, record a goalless draw at home to Llandudno and then a heavy defeat to The New Saints – but their last two performances suggest that it is not all doom and gloom at Richmond Park. Neil Smothers is now starting to make his mark on his team after a good 2-0 win over Cardiff Met was followed up last weekend, with an equally as impressive 3-0 victory against in-form Newtown. Smothers served for several years as assistant to former manager Mark Aizlewood before taking over last season and says he is pleased with how the team are gradually progressing. “The team and how we play isn’t going to change overnight but we’re trying to do things slowly but obviously pick up points as we go, so we’re happy with where we are and with the progress we’re making,” he said. Connah’s Quay’s Andy Morrison claimed August’s Manager of the Month award on Tuesday morning only to see his team lose to Caernarfon later that evening. Henry Jones wasted no time in picking up his first accolade since returning to the league, the Bala Town attacking midfielder was named Player of the Month. Connah’s Quay have been handed a home draw in the third round of the Irn-Bru Cup. They will face Northern Irish side Coleraine at the Deeside Stadium over the weekend of 13/14 October. Finally, congratulations to veteran Aberystwyth Town winger Geoff Kellaway, who made his 300th WPL appearance after coming on as a substitute against The New Saints midweek.